Sharjah’s Environment and Protected Areas Authority (EPAA) has joined hands with Emirates Nature-WWF, and the Emirates Marine Environmental Group (EMEG) to launch the Pearl of Sharjah development on Sir Bu Nair Island, a three-year project aimed at preserving the island's marine ecosystems and raising awareness about the environmental, cultural and heritage of the island. The project was unveiled during a community launch for Sir Bu Nair Project, as it raised awareness about the nature reserve's environmental, cultural and traditional significance. On the project, EPAA chairperson Hana Saif Al Suwaidi said: "HH Dr. Sheikh Sultan bin Mohammed Al Qasimi, Supreme Council Member and Ruler of Sharjah, declared Sir Bu Nair Island a protected nature reserve in 2000. Formerly a haven for pearl divers and fishermen, this island is of ecological, historical, cultural and political significance. "The goal is to use Sir Bu Nair Island as a model for the management of the UAE’s Marine Protected Areas (MPAs). We also plan to emphasise the socio-economic and ecological benefits of conserving marine environments. This project will benefit the environment, society and future generations of Emiratis," explained Al Suwaidi. At the launch, the public was invited to upload images to Instagram using the hashtag #pearlofsharjah. These images were then used to create a digital mosaic of the pearl-shaped island. To celebrate the launch, the project developers offered participants an opportunity to win two tickets to Sir Bu Nair Festival to witness the natural legacy of the Pearl of Sharjah. 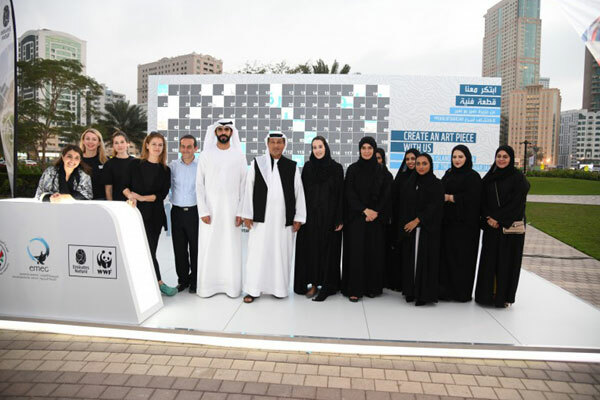 Laila Mostafa Abdullatif, the director general of Emirates Nature-WWF, said: "We are thrilled to have joined the Sharjah community with EPAA and EMEG on Friday to shine the spotlight on Sir Bu Nair island and share details of our exciting new expedition." "Our research in the field will commence in early 2019 with exploration and surveying of critical marine species and habitats, including sharks, rays, fish, birds and corals. Our aim is that our efforts on Sir Bu Nair will be showcased as a national blueprint for Marine Protected Area Management in the UAE," noted Abdullatif.